Prince George's County, Maryland, bustles with traffic. It's no wonder, being home to nearly 900,000 people, government facilities such as Joint Base Andrews, and major football and shopping venues. Many residents commute to jobs in nearby Washington, DC on weekdays, and on weekends, they drive to FedEx Field to see an NFL game or the National Harbor complex to shop. But during a snowstorm, commuter and other traffic can grind to a halt. Plows need to quickly get onto the county roadways to clear the hardest-hit areas. That's where GIS comes in. 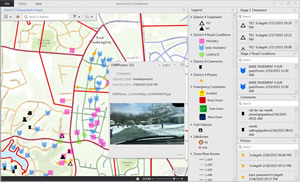 To speed up the process of coordinating where to send snowplows and salting trucks, the county's Department of Public Works and Transportation (DPW&T) teamed with Esri and the consulting firm Whitney Bailey Cox & Magnani (WBCM) to set up a real-time, GIS-based snow operations monitoring system. The team implemented a system that uses ArcGIS Online, Collector for ArcGIS and Operations Dashboard for ArcGIS. The system reports observations from snow inspectors in real time and helps supervisors coordinate deployment of snow-clearing crews. 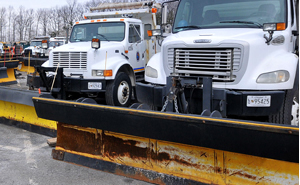 "[In the past], DPW&T snowplow inspectors would drive around their districts documenting snow conditions on a spreadsheet, which they would submit to the county's Emergency Operations Center when they returned to their district offices," said Patrick Callahan, GIS manager at the Prince George's County Office of Information and Technology. "Now, they are able to capture real-time snow condition information in the field with just a couple of clicks on a tablet, even sending pictures that document issues. This information is sent immediately to the Emergency Operations Center to give decision makers a great picture of the conditions so they can target areas with the most need." "After inspectors hit 'send' [in the app], those records instantly get translated into symbology in the spatial context of the route and district," said Callahan. "If a road needed salt or plowing treatment, it would be marked with a solid triangle. Passable roads with one lane open would get marked with a pink square. A green circle indicates 'all clear curb to curb.' 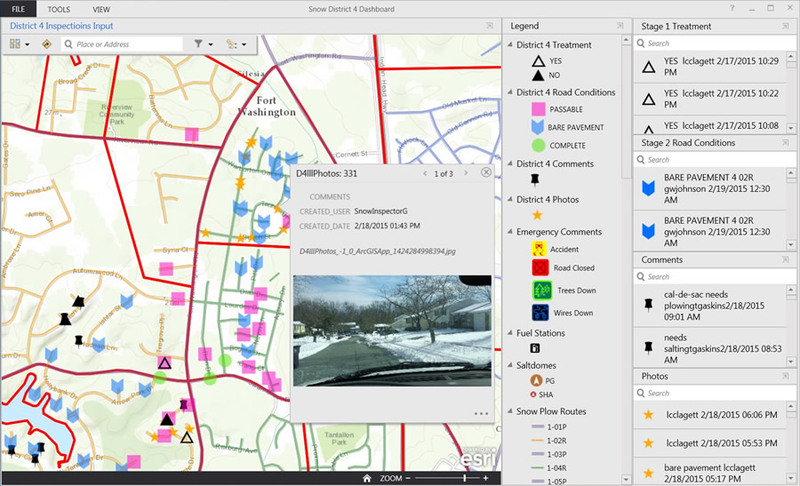 "
Each district crew can only see its own road condition feature layer on the map in the dashboard, but all district crews can view emergencies in the emergency layer, such as downed power lines and traffic accidents, since those issues can affect neighboring districts. The dashboard's map displays snowplow routes and color-coded symbols to denote closed, passable, and clear roads; accidents; and where trees and wires are down. "Imagine seeing the map gradually change from a field of solid triangles to hollow triangles to, eventually, all green circles," said Beth Schrayshuen, an engineer for WBCM and a project manager on the team. "The county couldn't even come close to that before with the old system." "I'm not a GIS professional at all," said Schrayshuen, who currently works for EA Engineering, Science, and Technology, Inc. "I'm just an engineer by trade, but I really really appreciate what ArcGIS Online does. Pairing a simple field app with a dashboard that displays live data from the inspectors at the scene is a great example of what it can do in any county or municipal operation." Adding extra sizzle to the system: the inspectors' ability to snap pictures of road conditions, which display as clickable orange stars on the map. The pictures serve as empirical proof in case of a mistake in data entry within the app. "Staff love the option of clicking the photograph to verify the road conditions," Schrayshuen said.